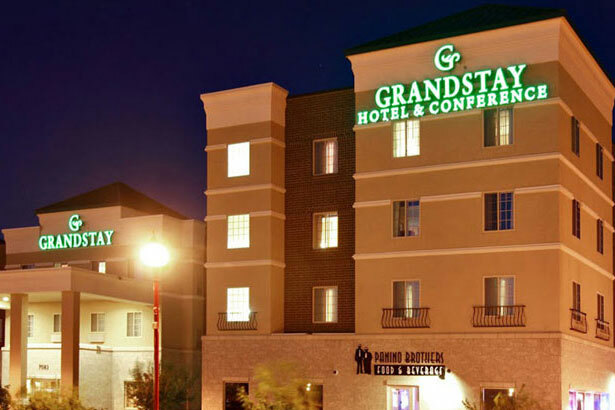 Top rated among local hotels and winner of TripAdvisor’s 2013 Certificate of Excellence, GrandStay® Hotel & Conference in Apple Valley, MN, is the ideal choice for anyone planning a business meeting or celebration in the Apple Valley area. LaGrand at GrandStay®, our new conference and event center adjacent to the hotel, has a range of meeting rooms and event spaces which will accommodate any type of corporate or social function, whether formal or informal for up to 200 guests. For more information about the La Grand at GrandStay®, please visit the LaGrand website. We have a selection of spacious suites to meet all requirements, from families to business travelers. Full-size kitchens and generous amenities make our suites perfect for both short visits and extended stays. All guests can enjoy a complimentary breakfast from the hot and cold buffet, relax in our indoor pool, or take a break with premium coffee available 24/7 in our lobby. We also provide free Wi-Fi access throughout the hotel. GrandStay is the only hotel in Apple Valley with a two FREE SHUTTLES to/from the Airport as well as by special request to Mall of America and Minnesota Zoo. At anytime, the new RED-LINE TRANSIT, the 1st BRT Line in Minnesota is within a block of the hotel and arrives every 15 minutes from 5 a.m. to midnight and goes direct to Mall of America to connect with Light-Rail to anywhere in the Twin Cities. Little need to rent a car with that kind of availability.